Rural Youth project is a project where young people have worked together towards a common goal on a voluntary basis. This competition can gain your project visibility on a European level! The board have chosen 3 entries and are ready to open the voting to the public on RYEurope Facebook until the 31st March 2019. You havea chance to collect more points for your project through the voting. The project with the most points wins the Rural Youth Project competition. The winning project will be announced at the beginning of April 2019. "TINKEREI — from old to new" should be the Rural Youth Project of the Year 2018! Through this project we have enabled the self-realization of young people through an amazing and creative product. Furthermore it is offering an opportunity to find a personal vocation. The main idea of our innovative and sustainable project is basing on the theme of the year of the Rural Youth of Upper Austria called “Village Mind — Experience Tradition”. The combination of the components tradition in general, do-it-yourself, costume and the modern gym bag has developed the traditional backpack for the society of Gmunden. The name TINKEREI is based on the English verb “to tinker” and means to make something out of useless substances to a sustainable new thing. We tried to craft or rather to tinker something beautiful and home-made during sewing-workshops! On one hand the aim of the project is to revive the well-known tradition of sewing in the district of Gmunden and on the other hand to counteract against the throw-away-society through giving useless objects a second chance. The organization of the project was carried out by an organising committee of the Rural Youth Gmunden. This way of organization increased the realization of our project and besides that the main performance, to stick to goals and to obtain funding. Our project idea is special because of its uniqueness. The, how we call it, “Tinker-boom” spread beyond the borders of our district. In total 97 enthusiastic people from the districts Gmunden, Vöcklabruck, Kirchdorf, Schärding, Wels and even non-rural-youth-members participated at the Workshops. In total 114 tinker-bags have been sewed (estimated number). The project completion was a fashion show at which 23 participants showed their workpieces. Throughout the project we were able to raise the amount of €1.005,- which we donated to the “ZIB Hagenmühle”, for the support of emotionally impaired persons and to the so called “project organisation for the forests and avalanche protection”. 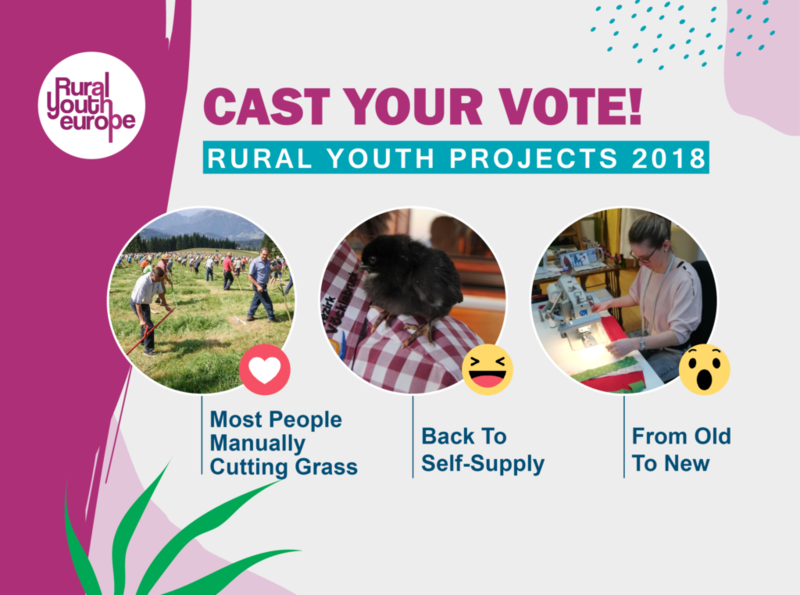 Project “Most people manually cutting the grass” shoud be the Rural Project of the year 2018 because this event was unique and innovative project which unites people from all over Slovenia and of all ages. We wanted to show that people in Slovenia still know and respect our tradition and old farm habit. We also want to keep this tradition for future generation. Our goal was to break the Guinness record – collect as many people as possible in one place in order to cut the grass. To achieve our goal team work was very important. We want to organize big event with a lot of participants and bystanders and while we were thinking how to achieve this we got an idea – try to break the Guinness record. Idea was realised in 4 months. Approximately 100 people were involved and participated in the organization of the project, majority of participants are members of DPM Škofja Loka (Rural youth association Škofja Loka). People from all over the Slovenia, members of similar societies and Association of Slovenian rural youth were participated by attempting the record. The President of the Republic of Slovenia, Borut Pahor, honoured us with his visit and participation in our record attempt. We had a lot of support from bystanders. Event was unique and full of country's spirit. People were proud to be part of this event both participants and bystanders. This was team work between young and older people in order to achieve the same goal. The event took place on Ski resort Cerkno (1291 m high, municipality of Cerkno) where 570 participants and 1000 bystanders enjoyed the unique event in Slovenia. The project of Rural Youth Vöcklabruck in 2018 was all about the production and self-sufficiency of eggs. In recent years it has become a veritable trend to keep chicken in your own garden to provide yourself with eggs. Unfortunately there have often been mistakes in keeping and feeding. To show how easy it can be to produce your own eggs, each of the 18 local groups of Vöcklabruck got three baby chickens. Side fact: Baby chickens are called in Austria "Singal" –mostly during the age of two weeks. The task was to raise the chicks up to healthy laying hens over the period of 21 weeks. Before the chicks moved in, each group had to build a welfare chicken coop. Further they had to move the chicks at least twice during their "growing up”, from one Rural Youth member to another one. The rearing phase was documented by each group in a diary. The target group of our project was not limited to Rural Youth members, but also the young people in society. Visits in primary schools were organized, where playfully the way from chick to egg as well as the most important points in terms of keeping chickens were explained. Regionality and self-sufficiency were the focus of this project. With the self-sufficiency of rural households we are strengthening our homeland and the awareness that food is a valuable product rather than a cheap consumer good. We also wanted to revive a piece of Rural Youth history. In 1951 3.000 American baby chickens were flown to Austria and received by members of the Rural Youth. The focus of the project was to grow the chicks up and give twice as many chicks as they had received to other farms. At the end of the project, the hand-raised chicks could stay with the Rural Youth members and continue to lay eggs. To vote go to our facebook post and chose the reaction that represents your favourite! Stage 1: RYEurope Board will do a judging to choose the three best projects for voting. Stage 2:After the board selections, a public voting will take place on RYEurope Facebook 13-31st March 2019. You havea chance to collect more points for your project through the voting. The project with the most points wins the RuralYouth Project competition. The winning project will be announced at the beginning of April 2019. The winner of the Rural Youth Project of Year will be awarded with two places to the European Rally. In addition, their travel expenses are refunded up to 250 euros. NB!  Please note that by submitting the video/automated presentation you also agree to it being published on the website of Rural Youth Europe and social media sites Rural Youth Europe uses. the benefits to your organisation, members and local community. communication and advertising throughout the project. Vardavar International Festival 2017 from Amanda Hajnal on Vimeo. 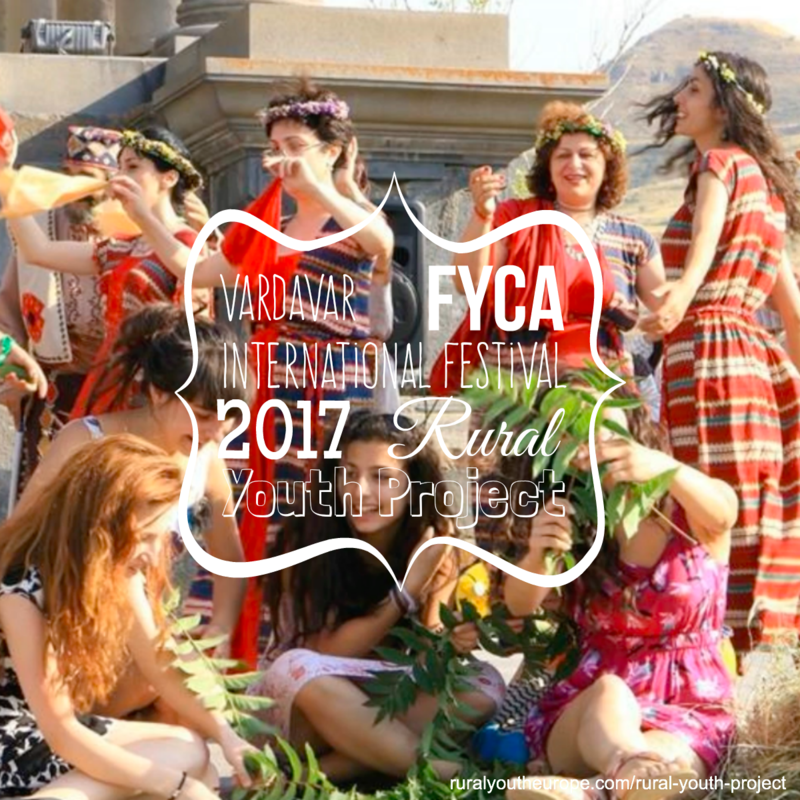 Since the festival gathered young participants from all Armenian regions by giving them the opportunity to take part in the project and interact with tourists which is very essential for rural youth to raise an intercultural competence. Also, there was an exhibition of handmade arts and crafts of children from several Armenian regions. It is important to mention that the owners of the local markets were mainly young people from rural areas and the festival fostered the development of their initiatives. The main purpose of the festival was to broaden the scope of “Vardavar” holiday, rituals, Armenian national songs and dances, and present to the whole world. In addition, promoting the prosperity of the tourism industry, ensuring sustainable growth of Armenia, protection of national values ​​among youth, social inclusion of rural youth, promotion of intangible cultural heritage make the base of the festival. Since protection of cultural heritage, regional integration and social entrepreneurship are some of the main activity areas of our organization, we decided to develop such project, which will make significant and intangible impacts on different spheres for the Armenian community. The project involved diverse groups: participants (youngsters from urban and rural areas), tourists, folk dance and song groups, actors for the performances, technical support group, coordination group, various NGO representatives, journalists and local people. The project had very positive impact both on tourists and the community. People got to know about one of the ancient holidays of Armenian culture and were immediately exposed to its celebration process. The festival promoted tourism and social entrepreneurship industry at the mentioned places, since local people were selling their homemade products nearby. So, by being broadcasted through various media, the festival attracted many more people to visit Garni and Geghard which impacted on the development of local social entrepreneurship initiatives.